SINGAPORE - A 52-year-old man who is believed to be involved in the production of $50 counterfeit notes has been arrested, police said. Police said it received a report last Thursday (May 26) that counterfeit notes were used at a convenience store in Hougang Street 91. The suspect was arrested along Hougang Avenue 8 that afternoon at about 3.15pm. A printer, a bag and several pieces of $50 notes, which are believed to be counterfeits, were seized. A photo of two fake notes have been circulating on messaging service WhatsApp recently. The two $50 notes in the photo have the same serial number: 5DC995967. 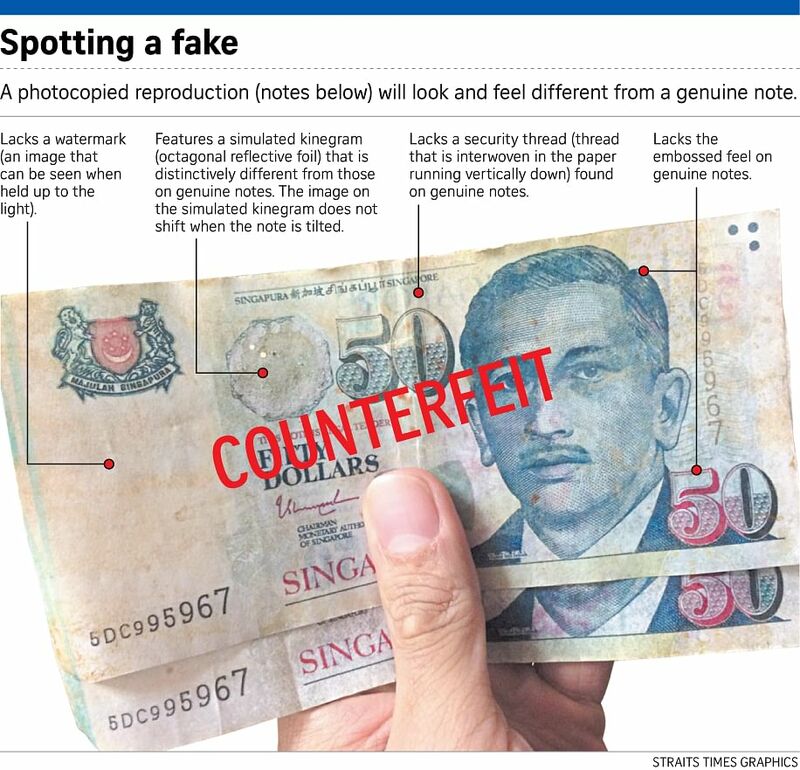 Hawkers in Hougang were on the alert on Tuesday (May 31) for the counterfeit currency, Lianhe Wanbao reported. Some wrote down the serial number and were checking $50 bills that they received against it. A Hardwarezone forum said the notes were supposedly collected at an NTUC FairPrice supermarket outlet in Hougang. In response to media queries, a FairPrice spokesman said that he was aware of the news. "We are currently conducting an investigation to verify the validity of this claim," he said. All FairPrice outlets are equipped with necessary devices, including UV machines, to verify that currency is legitimate . "In addition, should any false notes be found in our cash register, it will be removed to prevent circulation and handed over to the authorities," the spokesman added. The counterfeit notes, which are believed to be photocopied reproductions, lack security features found on genuine notes. These include as a watermark, and a security-thread, which is interwoven in the paper and runs vertically down the note. The simulated reflective foil on the fake notes do not shift when the note is tilted. The surface of the counterfeit notes also lacks the embossed feel on genuine notes. To date, the counterfeit notes in the cases reported bear four serial numbers, police said. They are 5DC995967; 4KT595133; 4AX921719 and 4LB831932. Police warned that there may be counterfeit notes with other serial numbers, and asked the public to be alert to them. Anyone who spots a suspected fake note should delay the person who presented the note, if possible and call the police at 999 immediately, police said. They should also observe the person and note identifying features such as gender, race, age, height, build and attire. Other things to look out for are tattoos, ear studs, the language he or she speaks, and if the person has a companion. Witnesses should also note the person's vehicle registration number, if any. If any suspected counterfeit notes are received, they should be placed in an envelope or other protective covering and handed over to the police. The police can be reached at their hotline at 1800 - 255 0000, or at 999 in urgent cases. Information can also be submitted online. Anyone who is convicted of counterfeiting the currency can be jailed up to 20 years, and fined. For more information on differentiating between genuine and fake notes, refer to the Monetary Authority of Singapore's website.